Steele Canvas Basket, established in 1921, is the most respected manufacturer of canvas and polyethylene baskets, trucks, hampers, buggies, bins and canvas bags in the industry. Known for high quality products that never seem to wear down, Steele has been satisfying demanding customers for decades. Already the world's leading retailer of laundry and linen carts, Tank Depot is proud to add Steele Canvas B asket produts to our list of outstanding suppliers. Noco Aluminum Sealed Battery Boxes are fabricated from a durable aluminum sheetmetal for optimal resistance to shock, vibration and corrosion. 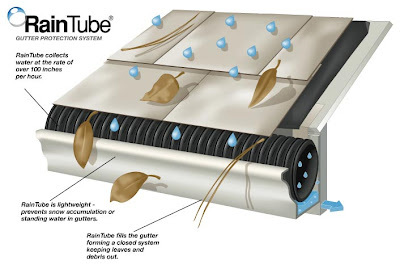 A completely sealed design features an external vent tube for adequate ventilation of acid vapors. Easy to install and comes complete with captive lid, cable grommets, lid gasket, vent hole, stainless steel 3/8" j-bolts, hold-down, nuts and bolts. Meets NHRA 8:1 and IHRA, USCG Code of Federal Regulation 183.420 and ABYC E-10.7 specification. You'll find Noco aluminum and poly battery boxes among the largest collection of marine and industril battery boxes in the world at TankDepot. Lancaster Pump offers a broad selection of 4" submersible well pumps. They range in horsepower from 1/2 to 5 HP, with the most popular size range 1/2 to 1-1/2 HP, available in Corrosion Resistant Thermoplastic or Super Strength Stainless Steel. Capacity ratings are 5, 7 ,10, 15 and 22 gallons per minute with heads as high as 990 feet. Jet Pumps are available in shallow well (lifts to 25') to deep well (lifts to 160'), single stage and dual stage, 1/2 to 2 HP, Lancaster Jet Pumps are terrific for delivering water or boosting existing pressures in residential applications. Designed to be surface mounted, these pumps deliver capacities from 1 to 31 gallons per minute. Self Priming Centrifugal PumpsWorks like the shallow well jet pumps (lifts to 20') but deliver high capacities from 7 to 79 gallons per minute. Common uses are: lawn sprinkling, irrigation, auto washing and pool filling. 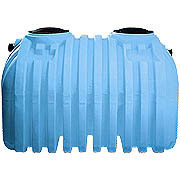 Chris Glen, Tank-Depot.com Operations Manager, annouced today that the website is adding the products of Steele Canvas Basket Company to their lineup. Steele Canvas Basket, established in 1921, is the most respected manufacturer of canvas and polyethylene bas kets, trucks, hampers, buggies, bins and canvas bags in the industry. Known for our high quality products that never seem to wear down, we also boast a knowledgeable customer support staff capable of answering all your questions and a production crew who take pride in the goods that ship daily from our docks. Steele takes care of customers from start to finish, and that care is reflected in all of our products. Tank Depot is the nation's leading retailer in poly tanks, material handling equipment and marine products. Kevin Crutchley, GM at Tank Depot of Jacksonville, is very happy to announce the addition of Leonard Martin. 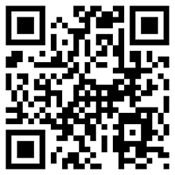 You may reach Leonard at lmartin@tankdepot.com or by telephone (904) 366-1360. Tank Depot of Jacksonville is the largest tank dealer in the region, located at 2116 West Beaver Street Jacksonville, FL 32209 - just minutes from I-95. 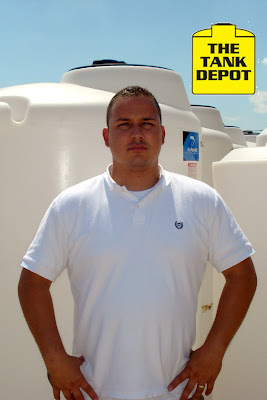 Tank Depot of San Antonio is happy to announce the addition of Rudy Gonzalez to our staff. 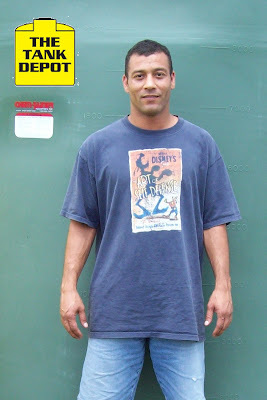 You may reach Rudy at rudyg@tank-depot.com or by telephone at (210) 648-3866. The store is fully stocked with tanks of every size and description. 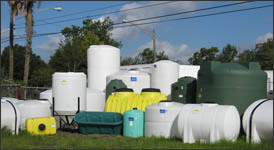 We are the largest stocking dealer in Texas for Chem-Tainer, Ace and Norwesco Tanks! In Stock For Immediate Delivery - Water Tanks, Underground Water Storage, Transport Tanks, Chemical Tanks, Pressure Wash Tanks, Bait Tanks, Elliptical Leg Tanks, Horizontal Tanks, Open Top Tanks - And many, many more! Esequiel Flores and Rudy Gonzalez are standing by to serve you Monday through Friday 8 - 5 PM. Need to pick-up on a weekend? Just give them a call and they'll be happy to help. The Gas Caddy meets all current U.S. Coast Guard standards and meets U.N. and D.O.T. specifications when used according to Todd’s instructions for transporting fuel. All Caddies bear the UN Marking, “UN3H1W”. U.S. Patent #5667113Gas Caddies hold 28 Gallons of fuel and meet DOT requirements. Features include 10 Feet (305cm) of U.L. approved hose with static wire, molded hose brackets, U.L. approved, spring loaded nozzle, 3/4" U.L. approved ball valve, aluminum non sparking axle, pneumatic tires with nylon bearings, nylon wheel hubs, vented cap and a molded-in baffle for strength & durability. 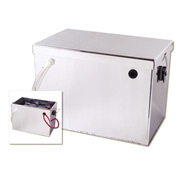 Optional pump kit is available to transfer fuel easily above the height of the caddy. 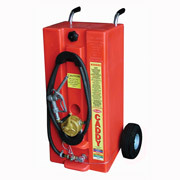 The Todd Evacuation Caddy w/ Industrial Pump The Todd Evacuation Caddy solves fluid transfer problems. Drain or fill gas tanks with ease. 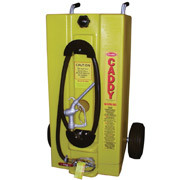 Constructed of cross-linked polyethylene, the 28 gallon Evacuation Caddy comes with an industrial grade 2-way rotary hand pump with a ¾" ID UL approved 10' hose with ¾" ball valve and flexible siphon hose. Designed with easy grip handles and pneumatic tires and proportioned for comfortable balance and movement, the Todd Evacuation Caddy is ideal for larger service areas. UN and DOT approved (#UN3H1W). If your home has a septic system, you are one of a growing number of homeowners in the United States that rely on private sewage disposal. Twenty-five percent of total housing, and 33 percent of new homes in the US use onsite wastewater treatment, also known as septic systems. In addition, Professor Mike Hoover of the Department of Soil Science at North Carolina State University maintains that "forces such as urban and suburban sprawl and the high costs of central sewage systems for builders and governments" increase the number of septic system users each year. For septic system owners, proper maintenance can mean the difference between a long-lasting, trouble-free system and one that ultimately racks up tens of thousands of dollars in problems. Yet, many people receive conflicting and confusing advice about what maintenance is necessary. Most professionals recommend that septic tanks be pumped every 2 - 3 years to remove collected solids, but many private companies have another solution -- use low-cost septic additives on a regular basis to reduce the need for the more costly pumping. Additionally, when a septic system is in trouble and costly repairs or replacement looms, many additives offer a quick fix. So what's the truth? Are septic system additives (there are about 1200 on the market today) the next best thing to indoor plumbing, or are they money down the drain? Some experts say additives do more harm than good, and some believe that they are not harmful, but they don't do much of anything at all, except cost money. Other than the septic additive manufacturers themselves, we could find no scientist, engineer, academic, or government source that recommends the use of septic system additives. In houses with septic systems, when the toilet flushes or the washing machine runs, wastewater leaves the home and collects in a septic tank. There, the natural bacteria in waste break down most of the solid material into a liquid or gas. Heavy solids or bits of plastic or other material that can't break down, drop to the bottom of the tank and form the sludge layer. Lighter substances such as grease or oil float to the top, which is called the scum. From there, the relatively clear liquid in the middle of the tank, called effluent, flows out and is absorbed into the drainfield that surrounds the tank. It's a relatively simple, natural process. Septic tank additives, also called septic tank treatments, cleaners, restorers, rejuvenators, and enhancers, fall into two categories: chemical and biological. Chemical additives are marketed to open up clogged drains and to break up grease and oil. They include active ingredients such as sulfuric acid, which can be highly corrosive and cause structural damage to a septic tank. Additionally, it is generally recognized that exposing soil and groundwater to harsh chemicals can harm the environment; therefore, according to an article in the Journal of Environmental Health, chemical additives "have limited use today." Biological additives are made from bacteria, yeast, and/or enzymes. They are said to work as starter agents in new systems and to increase the efficiency of breaking down the solids in existing systems. Biological additives are often sold as routine maintenance, flushed down the toilet on a monthly or weekly basis to assure the septic system's "balance." In terms of the environmental impact from biological additives, The Journal of Environmental Health reports that most "wastewater experts" are not concerned. Septic tank additives are readily available for purchase in home improvement or building stores, hardware stores, and supermarkets. They are advertised on TV and on the internet. Lastly, sometimes additives are promoted through telephone solicitation or door-to-door sales. In the face of extensive marketing, homeowners need to be educated consumers about what they are getting. Jennifer Hause, a scientist at the National Environmental Services Center at West Virginia University, believes that "people do not understand what happens in a septic tank. The process is a natural biological process that does not need anything to help it do its job." Of particular concern is the claim that some products reduce or eliminate the need to pump the septic system on a regular basis. Pumping solids out of the tank is considered a vital and basic practice in most guides to septic system maintenance. Encouraging homeowners not to pump their tanks can have disastrous long-term effects. Hause explains, "As long as wastewater is entering a septic tank, solids will be present. The job of the septic tank is to keep as many of the solids in the tank (retention and settling) - not let them pass on to the next treatment process which in many cases is a drainfield. If a product claims reduction or elimination of the need to pump, I would have to ask where then do the solids go if they are no longer in the tank? Not all solids present in wastewater can be turned to liquids and gases as some claims have been made." Because the design on any septic system depends, in part, on its specific surrounding environment, local health departments are often the best source of guidance and information for the homeowner. "Homeowner/users should check with local permitting authorities, in most cases local health departments, to make sure there are no provisions in place that disallows the use of additives," Hause says. In the states of Washington and Massachusetts, only approved additives are allowed for use, sale, or distribution. In both cases, the state government is screening for harmful ingredients and not providing "an endorsement or approval with respect to the benefit, effectiveness, or performance of the system additive." The Washington State Legislature stated in 1993 that "most additives do not have a positive effect on the operation of on-site systems, and can contaminate groundwater aquifers, render septic drainfields dysfunctional, and result in costly repairs to homeowners." In 1994, the legislature added, "Chemical additives do, and other types may, contribute to septic system failure and groundwater contamination. In order to determine which ingredients on non-chemically based additive products have adverse effects on public health or the environment, it is necessary to submit products to a review procedure." The state of Washington does not allow additive manufacturers to use the word approved for marketing purposes, but product materials may say "complying with Washington laws regarding harm to public health and water quality." "Much needed research," Dr. Hoover wrote in an email, "is of interest not just to practicing professionals in the on-site wastewater field, but is also of significant interest for many homeowners, too, who desire to protect their home investment and the environment at the same time." And yet, solid independent research has been scarce over the last forty years. Two studies conducted in the late 1990s are notable. In 1997, Hoover directed what has been called a "landmark" study by then-graduate student Gregory H. Clark. Using 48 septic systems in two mobile home parks, Clark set up three groups of tanks to receive additives and one to act as a control. The tanks were divided into groups that had been well maintained (recently pumped), poorly maintained (rarely or never pumped in 15 -20 years of use), and those that fell into the middle. The primary researcher collecting and analyzing the samples from the tanks did not know which tanks had been treated, and the study received no funding and had no involvement from septic additive companies. The three products tested were from Drano, Liquid Plumr, and Rid-X. Various measurements, such as the depth of the sludge (solids), the thickness of the scum, the number of floating solids, and the total amount of bacteria present in the tank were collected over the period of a year. The study concluded that "the additives tested did not provide any substantial or long-term statistically significant benefits compared to the control" for the items that they measured and in the conditions of this study. The authors also called for continued research under broader circumstances before" definitive conclusions" could be drawn. This study is published in the January 2008 Journal of Environmental Health. A second, unpublished field study of bacterial additives done by the National Association of Wastewater Transporters, Inc (NAWT) followed 12 septic tanks for two years. They similarly concluded there was no change in sludge accumulation at the bottom of the tank or in the number of floating solids. They did find a 30 percent reduction in the floating scum layer, a statistically significant finding, but also found an increase in fats, oils and grease in the septic system outflow to the drainfield, which could cause other problems. The NAWT concluded that the additive seemed to have no detrimental effect on the septic systems, but does not hold an "opinion, positive or negative, as to the use of bacterial additives in the septic tanks." Most chemical additives, which clearly harm septic systems and the environment, are no longer being marketed. Biological additives are mostly benign, but unnecessary, "re-branded potions sold under private labels," according to septic system engineer Sanford Mersky. Some homeowners worry that medicines they take or cleaning solutions used in the house can kill or harm the necessary bacteria in their tanks. Hause recommends that whenever there is a perceived problem in a septic system, homeowners should have it evaluated by a septic professional, and she says, the local health department is the best place to start looking for resources.